Neutrophils. 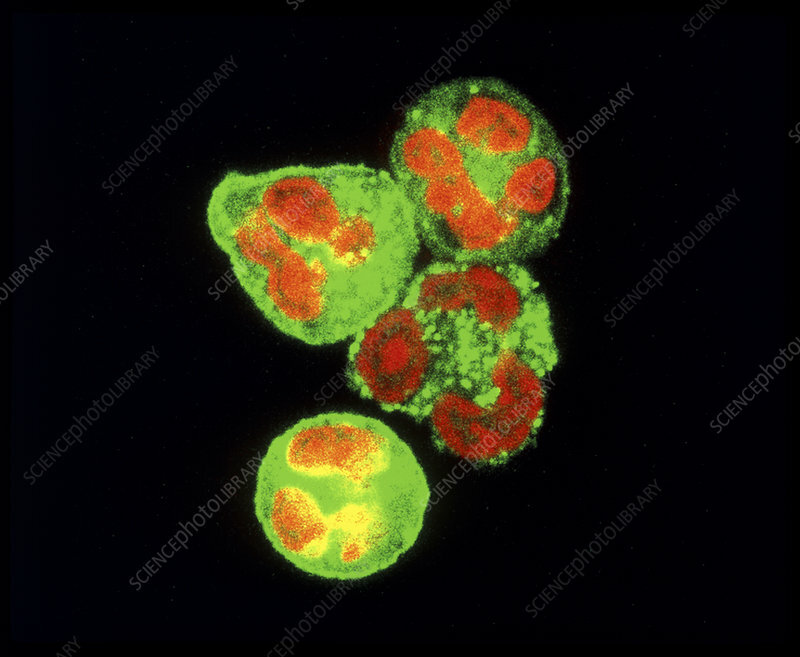 Fluorescent light micrograph of neut- rophil white blood cells. Cell nuclei are orange and a natural cell protein, lipocortin-1 is green. Lipocortin-1 has a role in preventing rheumatoid arthritis. Neutrophils normally move through blood vessels to sites of infection in the tissues, where they engulf invading microorganisms. In rheumatoid arthritis, neutrophils attack body tissue. Researchers have shown that lipocortin-1 naturally discourages neutrophils from leaving the blood stream & causing inflammation. Substances that mimic this effect may be an effective treatment for rheumatoid arthritis.